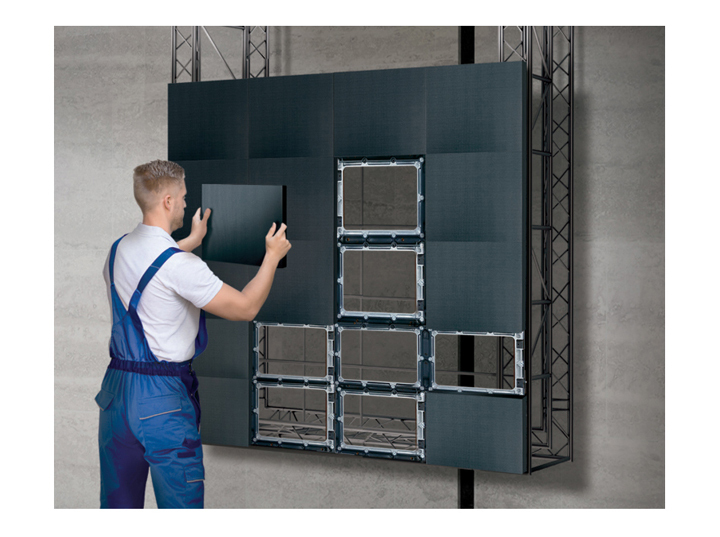 The LAPE series brings technological innovation and artistic values together, with a world-class slim LED screen and flexible design concepts. 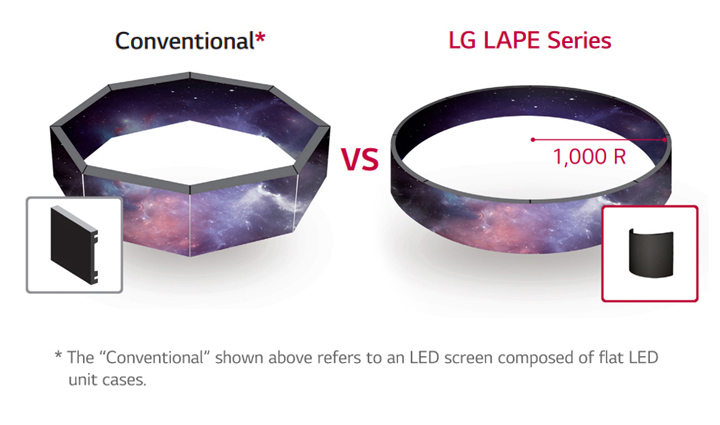 With a specially designed flexible LDM(LED Display Module), the LAPE series supports true concave and convex curvature up to 1,000R. 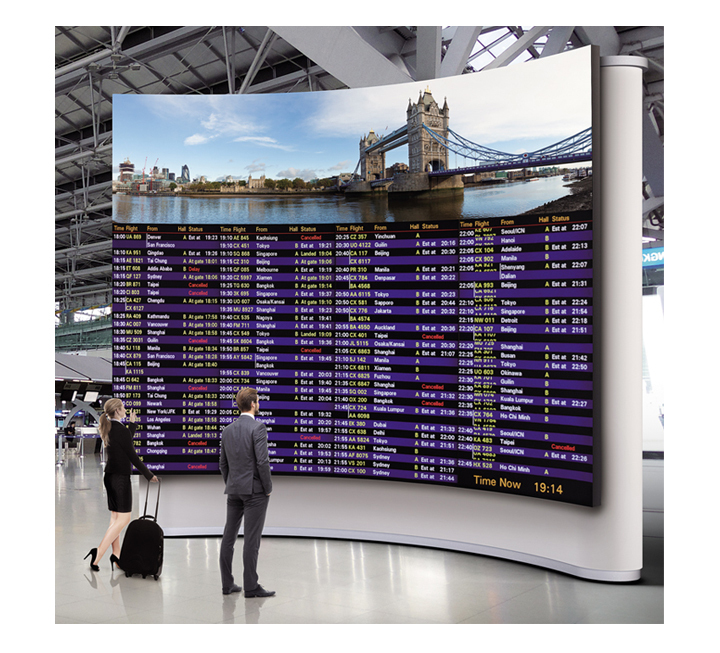 This greatly amplifies design flexibility, providing users with the ability to create true curved screens for use in interior design or as an immersive screen experience. 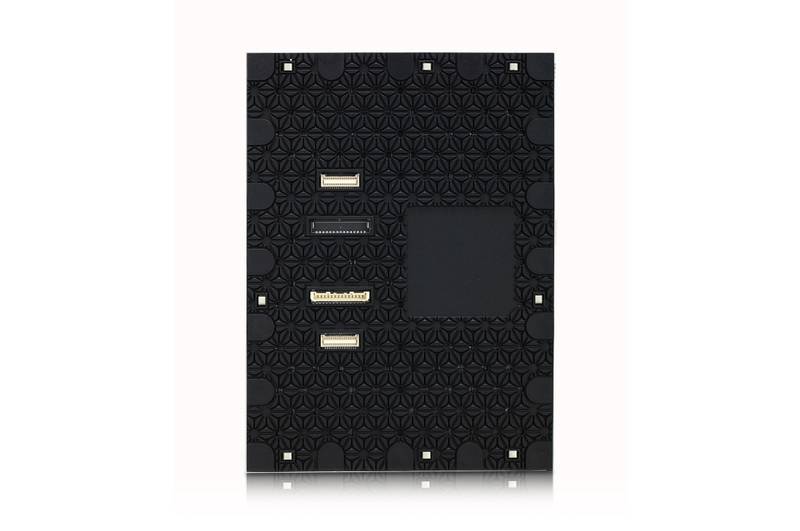 The power module is separate from the screen, resulting in ultra-thin screen depth, which dramatically reduces the rear space required to mount the screen onto a wall. 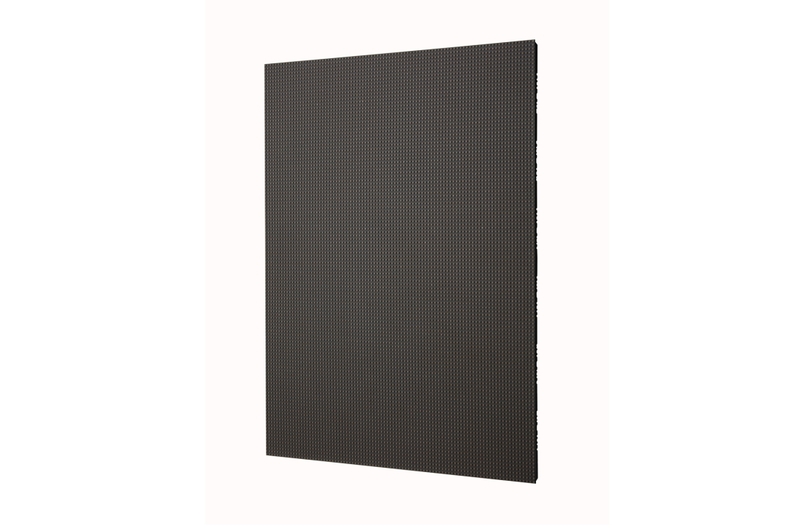 With its sleek design, the LAPE series satisfies ADA(American with Disabilities Act) regulations. 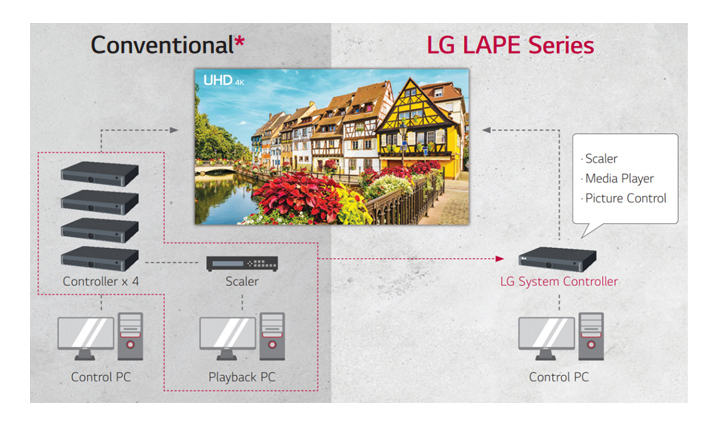 The LAPE series delivers vivid and distinctive picture quality through a wide range of color details with deep contrast thanks to LG’s exclusive ‘Dynamic Contrast Algorithm’. 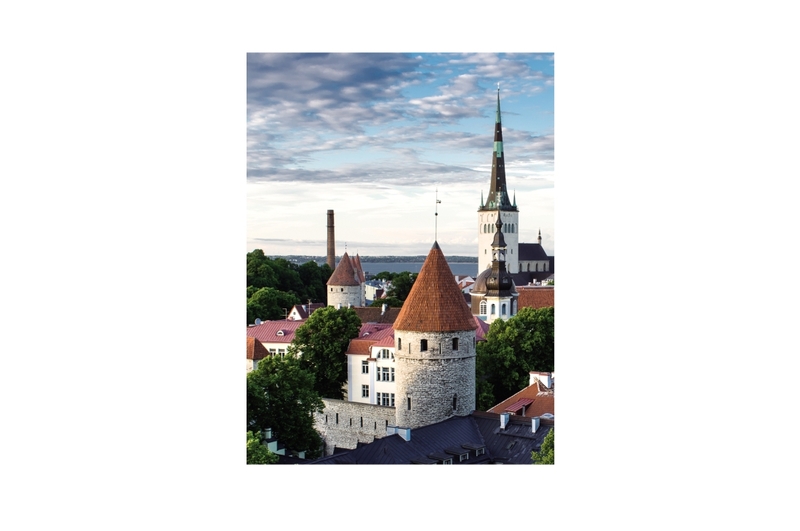 16-bit color processing provides a higher greyscale level, which seamlessly displays different depths and densities of colors without distortion, thereby giving a more realistic and sophisticated content. Powered by LG’s display technology, a high refresh rate of 3,840Hz assures the smooth playback of content. The flicker-free image prevents the black bars that occur from video shooting, as well as eye strain and blurred vision in viewers. The power supply units (PSU) are separated from the screen, dramatically improving the latter’s internal thermal condition. 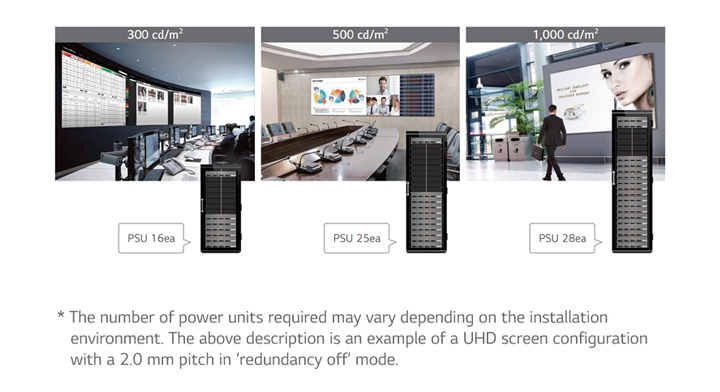 Thanks to the modular power concept design, users can choose the desired brightness of the screen by customizing the number of PSUs* based on the electrical capacity of the user environment. 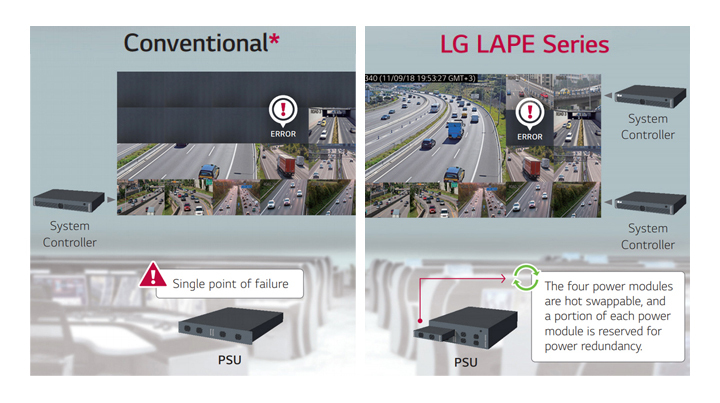 The LAPE series is designed to support power / signal redundancy (optional), providing users with peace of mind. 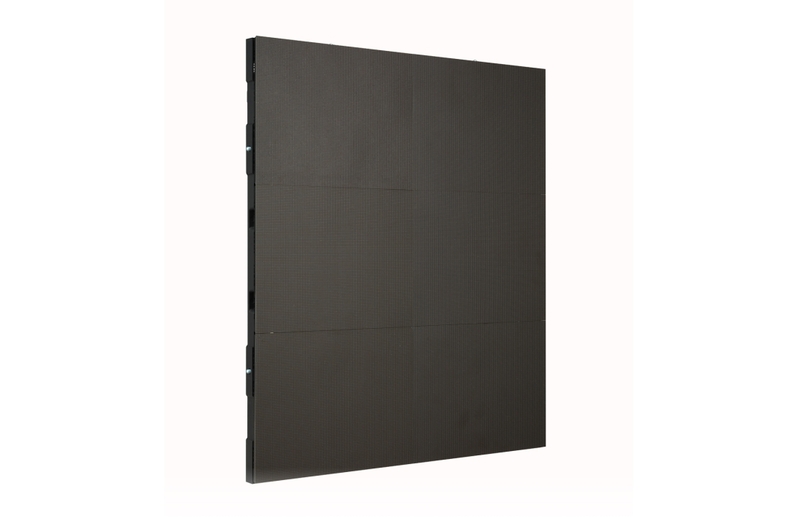 The power supply units (PSU) support power redundancy, assuring the continuous operation of the screen without power failure, while the dual controllers minimize screen failure with a bi-directional signal input. It has often been difficult to configure a perfect FHD/UHD resolution screen prohibiting native resolution image display. 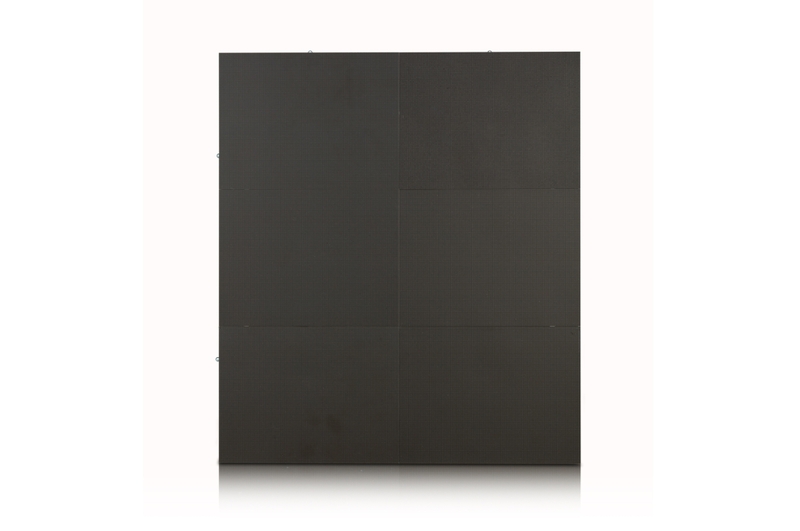 With the LAPE series, this is possible for all model options. 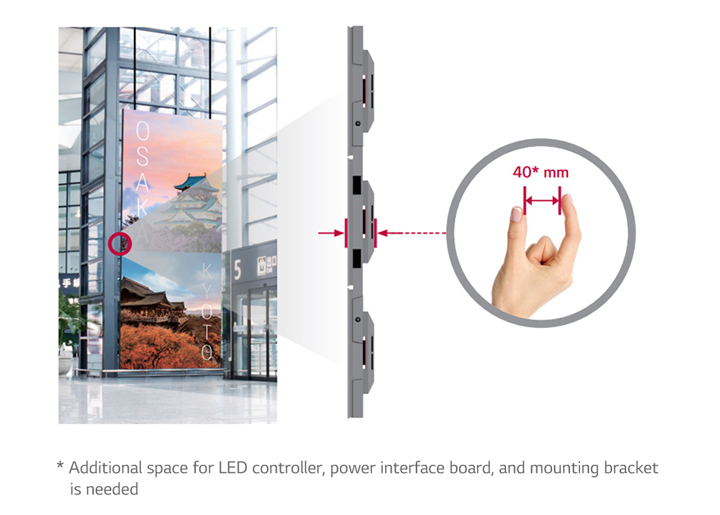 LG’s new management control software platform ‘LED Assistant’ provides easy screen management. 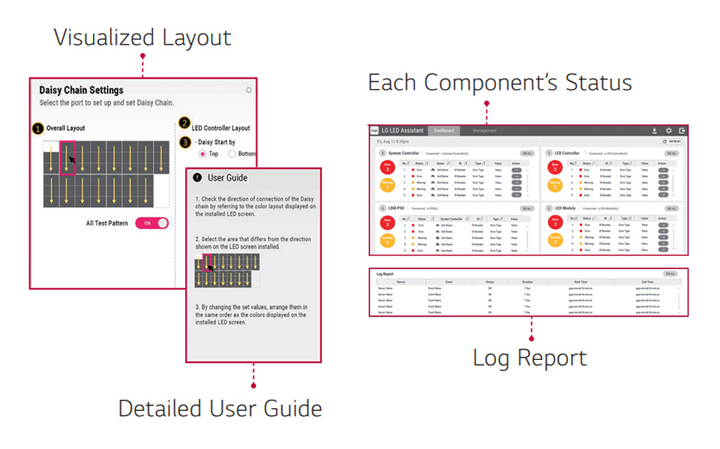 Screen setting is made simple with a visual guide and all-in-one dashboard that shows the overall status of screen components at a glance. 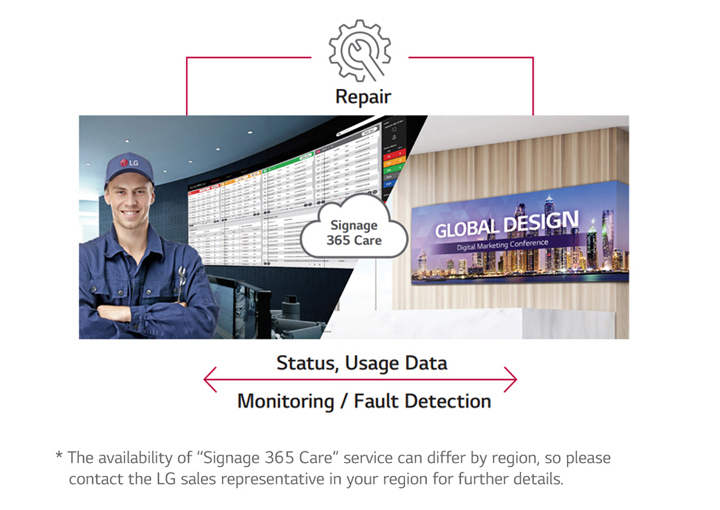 The maintenance gets easier and faster with an optional service Signage 365 Care*, a cloud service solution provided by LG service. It remotely manages status of LED displays in client workplaces for fault diagnosis and remote-control services, ensuring the stable operation of a client’s business. 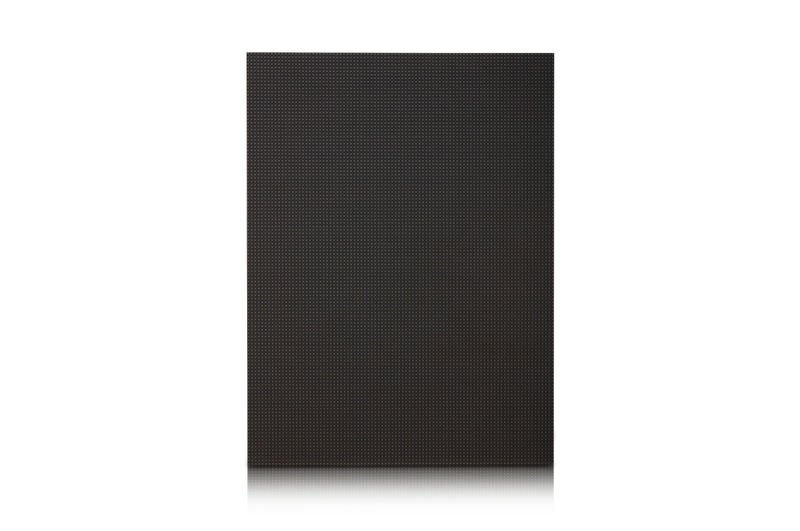 Conventional large-sized and heavy cabinet-based installation often results in LED dot defects during installation. 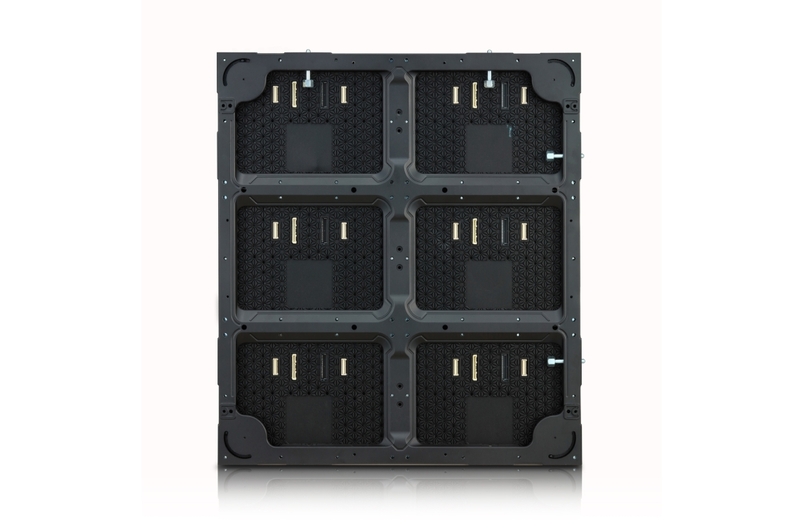 The LAPE series breaks free from conventional norms by introducing much smaller and light weight LDM(LED Display Module)-based installation, providing incomparable ease of handling. 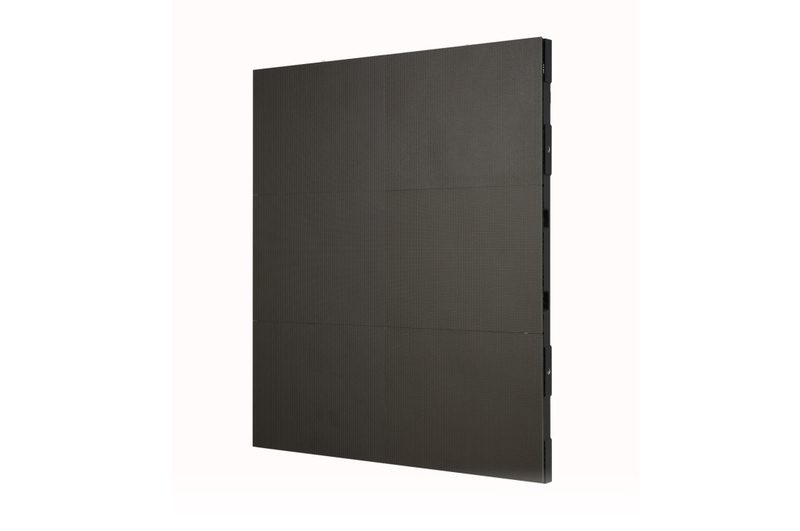 The LAPE series comes with front installation and front service access, freeing users from needing rear access space, as well as a sleek screen design for maximum space optimization.